Intuitive technology guides consumers to the right care and enables real-time scheduling through any access channel: on the web, in call centers, and in provider offices. Digital care coordination is the future of healthcare. For too long, care coordination has relied on inefficient processes, fax machines, countless phone calls, and too many disjointed systems. Our mission at MyHealthDirect is to make access to care easy for everyone. We have devoted ourselves to developing elegant solutions to complex problems. The result of our work, in partnership with some of the nation’s largest health systems and health plans, is a digital care coordination platform, purpose built to improve access to care. From integration to analysis, we are helping our clients improve care delivery across their networks and helping patients get the care they need. Integration services and provider recruitment to build and connect your digital network. Our platform is EMR/PM system agnostic, enabling guided search and scheduling capabilities across disparate systems. Our team of dedicated specialists facilitate provider onboarding with expert knowledge and training to ensure digital care coordination is met with solid adoption across your provider network. Automated outreach via text and IVR to connect patients to care. We are the only end-to-end solution that can include real-time scheduling directly into text message and IVR outreach campaigns. In addition to automated outreach, our platform can support call center agents doing outreach or include scheduling links in your email campaigns. No matter the method, MyHealthDirect accelerates the ability to reach patients with digital appointment scheduling. Business rules guide patients to the right care. Eligibility and authorization in one easy to manage workflow. Our platform is designed to improve workflow management. This includes the many steps required to coordinate referrals, capture the necessary data to qualify patients, and ensure that referral appointments are completed. Digitally book appointments from any access channel. The ability to book an appointment is the keystone of patient access. We give patients a real, confirmed appointment with the right provider or service. 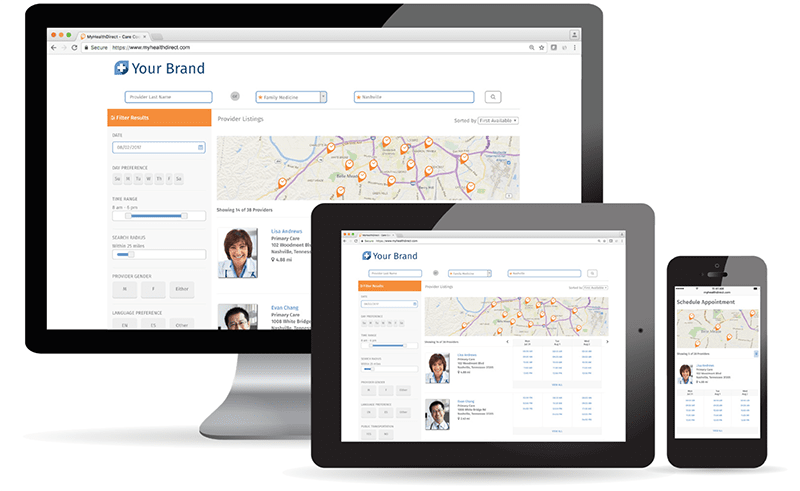 Whether it is a patient self-scheduling online, or a call center agent booking on behalf of a patient, or a discharge nurse scheduling follow-up care, our white-labeled solution supports your brand and enables real-time scheduling for the right care anywhere on any device. Data science and analytics consultation with advanced reporting. One of the key benefits of digital care coordination is the ability to capture data across disparate systems. Our team of data scientists provide custom reporting and analysis to get the most out of your care delivery network. With our consultative services we turn these insights into action and work with you to continuously improve your network design and how we deploy our services to best meet your needs and the needs of your patients or members.